I hope the materials and exercises on this website have given you a greater understanding of how to use the indefinite and definite article. It is my pleasure to share my work and expertise with you. While everything I do here is a labor of love, running this site requires time and money. 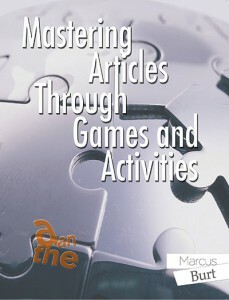 If the lessons that you’ve learned here have helped you, please show your support by purchasing a PDF, or a hard copy, of my book Mastering Articles Through Games and Activities. It has plenty of other exercises and examples that should make your knowledge of the indefinite article and definite article complete. 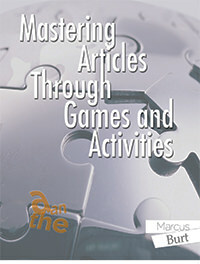 If you are a teacher, this book will liven up your class as it is jam packed with games and activities! You’re students will be eternally grateful. Thank you for being a part of the Mastering Articles community.